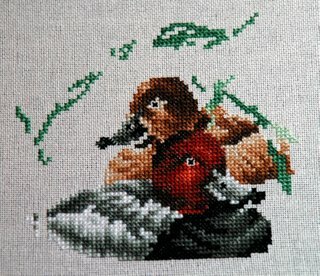 Anne S • This entry was posted in Cross Stitch, Round Robins and tagged Cross Stitch. Bookmark the permalink. That’s beautiful Anne. It will be lovely when it’s finished. Super progress on your RR. Where are your duck patterns from. My sister loves ducks and I am always looking for nice duck patterns for her. It looks wonderful, Anne! Don’t forget to take a scan before you post it off, so we can see your lovely ducky square done. 🙂 Enjoy your well-deserved days off, my friend!